The Padres hosted their inaugural "Anchorman" race at Petco Park Friday, featuring San Diego's favorite news team. SAN DIEGO (KGTV) — San Diego Padres games just got a little classier. 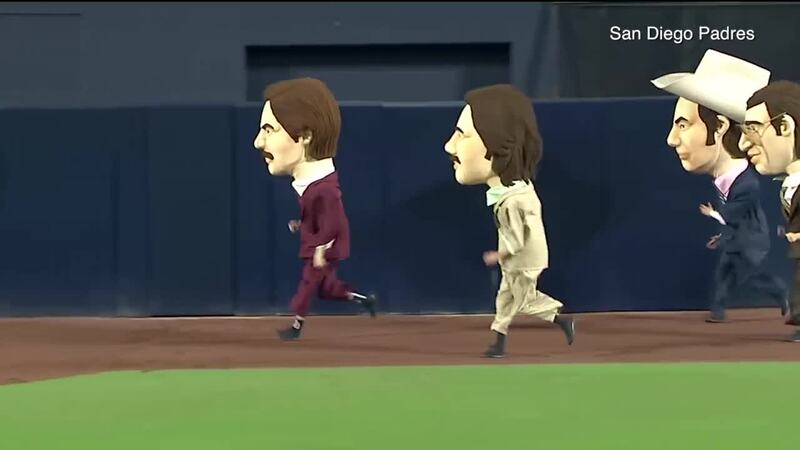 The Padres hosted their inaugural "Anchorman" race at Petco Park Friday, featuring San Diego's favorite news team from Channel 4: Anchor Ron Burgundy, sports reporter Champ Kind, reporter Brian Fantana, and weatherman Brick Tamland. And by the beard of Zeus, Burgundy took the first race handily. The race was created in collaboration with Paramount Pictures and actors Will Ferrell (Burgundy), David Koechner (Kind), Paul Rudd (Fantana), and Steve Carell (Tamland), according to the Padres. Each character is modeled after the "Anchorman" news team and it appears their trademark ego has gone to their heads. The massive heads were created by the same artist who modeled the Washington Nationals Racing Presidents and Arizona Diamondbacks Racing Legends characters. San Diego's race also joins the ranks of other races including the Milwaukee Brewers' sausage race and the Pittsburgh Pirates' pierogi race. Anyone else smell a street fight? Fans can expect to see the team race primarily on the weekends at Petco Park, as well as special games — it's kind of a big deal. The new "Anchorman" race is just the latest in new offerings at Petco, including a new beer created just for the team by Ballast Point, the Sycuan Stage concert venue at Park at the Park, and a revamped Compass Premier Club , the stadium's largest renovation since its 2004 opening.